Teeth grinding and other biting habits are more than a nuisance — they can generate twenty to thirty times the forces of normal biting. Over the long term, this can cause significant damage to teeth and supporting gums and bone. This particular kind of damage is known as occlusal trauma (meaning injury from the bite). In its primary form, the habit itself over time can injure and inflame the jaw joints leading to soreness, swelling and dysfunction. The teeth themselves can wear down at a much faster rate than what normally occurs with aging. And although less common but even more serious, the periodontal ligaments holding teeth in place to the bone can stretch and weaken, causing the teeth to become loose and increasing the potential for tooth loss. There are a number of techniques and approaches for treating excessive biting habits, but they all have a common aim — to reduce the amount of force generated by the habit and the associated problems that result. A custom occlusal guard, often worn while sleeping, helps lessen the force by keeping the teeth from making solid contact with each other. Tissue soreness and swelling can be relieved with anti-inflammatory drugs like aspirin or ibuprofen, muscle relaxants or physical therapy. In cases where stress is a main driver, behavioral therapy and counseling may also be helpful. 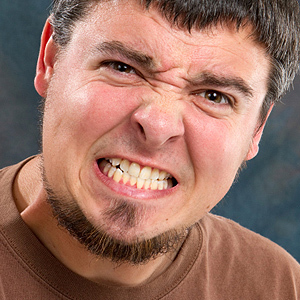 Biting forces are also an issue for patients with periodontal (gum) disease. In this case even biting forces within normal ranges can cause damage because the diseased gums and bone have already been weakened. If gum disease is a factor, the first priority is to treat the disease by removing built up plaque. Plaque is the thin film of bacteria and food remnant that’s both the cause and continuing growth of the infection, as well as tartar (calculus) from all tooth and gum surfaces. A thorough dental exam will reveal whether a tooth grinding habit is playing a role in your teeth and gum problems or if it’s magnifying the damage of gum disease. In either case, there are appropriate steps to stop the damage before it leads to tooth loss. So, What's a Dental Implant?